They save time – No more waiting around for the water in your tanked heater to heat back up. Tankless technology provides an endless supply of hot water whenever and wherever you need it, even in two parts of the house at the same time. Fill the bathtub while the dishwasher runs? Absolutely. Take a shower upstairs while someone takes one downstairs? No problem. 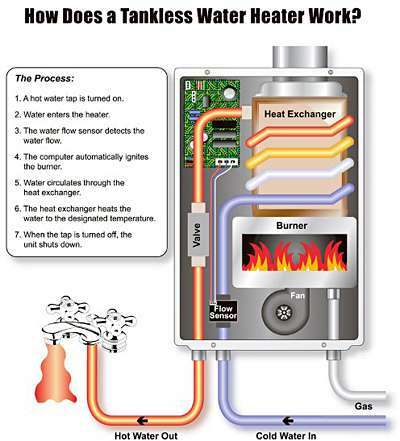 They save space– Tankless water heaters are much smaller than conventional tanked water heaters. They are about the size of a small suitcase. In fact, the units are so small they can be mounted directly on an interior or exterior wall, freeing up valuable space. They save you money– By heating water only as you need it, tankless technology helps save on energy and utility costs. The heat exchangers allow for maximum efficiency and can use up to 40% less energy than a traditional tanked water heater. A tankless water heater is also a smart investment for the long-run. They can increase your home’s value by adding premium technology and increased energy efficiency…big selling points to a potential buyer. They help save the planet– Tankless technology allows for much better energy efficiency, helping to conserve natural resources. And lower carbon dioxide emissions mean cleaner air and a healthier environment. Are you ready to make the switch to a tankless? We’ll send one of our technicians out to your home to evaluate your hot water use and determine which tankless unit is right for you. Give us a call at (803)794-2474 or contact us online to schedule an appointment.